Mimi's Transom - after installation. Mimi's Transom - before installation. Mimi contacted me about building a stained glass transom for her home in Gun Barrel City, Texas. She said this window faces west and will catch the afternoon sun, so she requested lots of bevels for that "rainbow effect". Mimi knew exactly what she wanted. She liked the heart and stylized tulip bevels and the pale blue waterglass border from Karen's Transom (pictured lower right). She also liked the central pineapple motif in Judy's Transom (also pictured lower right). Because her window opening was about half the length of Karen's Transom, we had to do a little creative drawing to make it all work. Mimi's Transom was completed in February, 2012. It measures about 12" x 36" and contains 84 pieces of glass. It now is creating rainbows in Mimi's home in Texas. Mimi's Transom - The blue, yellow, green and clear background glass is called waterglass. Its shimmering appearance, like rippled water, adds a certain amount of privacy while still letting in 100% of the light. 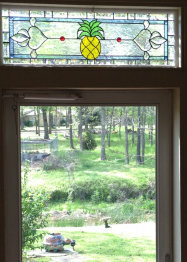 The waterglass, and the amount of beveled glass in this transom, should make this piece spectacular in full sunlight. Mimi explained why she wanted certain elements in her design. She says that the pineapple generally represents friendship and hospitality. She and her husband spend a portion of the year in Maui (Hawaii), and to her, the pineapple embodies the "aloha lifestyle" and the friendliness of the people there. She wanted the 2 beveled hearts in her design to be symbolic of herself and her husband. The transom is a gift from her husband to celebrate their 51st wedding anniversary. They proudly claim 3 daughters, 5 granddaughters, and 1 great granddaughter. It is always a joy when I get a chance to build something meaningful with really nice people like Mimi and her husband. 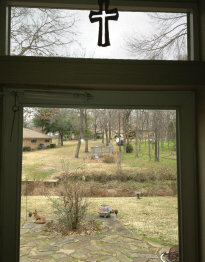 Mimi was kind enough to send me "before and after" photos so you can see the difference her transom makes in her home.